Fishing Charters, Boat Hire, Tackle and Bait, Deep Sea Fishing in the Byron Bay, Tweed Heads, Gold Coast, NSW, QLD, Australia. Australian Fishing Charters, northern New South Wales. bbq boats, camp boats, houseboats. 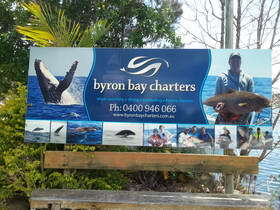 Fishing charters, self drive boat hire, fishing tackle and bait outlets in the Ballina, Byron Bay, Tweed Heads region. The Northern Rivers region is great for deep sea, beach casting and estuary fishing, and the many rivers and dams provide numerous opportunities for catch and release fishing. Look out for "Fishing the Tweed River & Coast" and "Fishing the Three Rivers" (Evans, Richmond and Brunswick rivers), which have maps of the rivers and estuaries, tide charts, fishing spots, boat ramps, NSW Fisheries information on sizes and bag limits, and more. Pick one up from the local Tourist Information Centre or most outlets below. Half day and Full day BBQ boat hire. Spend a day out on a luxurious pontoon boat complete with 1/2 cabin, gas barbecue and portable cooler to keep your drinks cold. Relax on a spacious vessel for up to 6 passengers, as you cruise along Gold Coast waterways and Broadwater. Do some fishing, go exploring, or just enjoy a day out on the water. Hop on board your half cabin cruiser and enjoy a relaxing and scenic day on the beautiful Gold Coast Broadwater. Hire this 17-foot (5 m) boat to take in the exquisite beachfront sights from the water or simply relax and soak up the sun. Alternatively, make use of the fishing rods on the boat to try and reel in a catch. Jump off to swim, pull up to quiet beaches or just kick back and recline on a boat built for comfort. Recfish Australia's mission is to represent the interests of recreational and sport fishers at a national level to ensure quality fishing. We seek your support in promoting this code and applying its principles in all your fishing activities.